UMBC's Marissa Somerville (left) tries slow down the University of Maine's Liz Wood's drive to the basket in an America East contest on Feb. 26 at the Cross Insurance Center in Bangor. 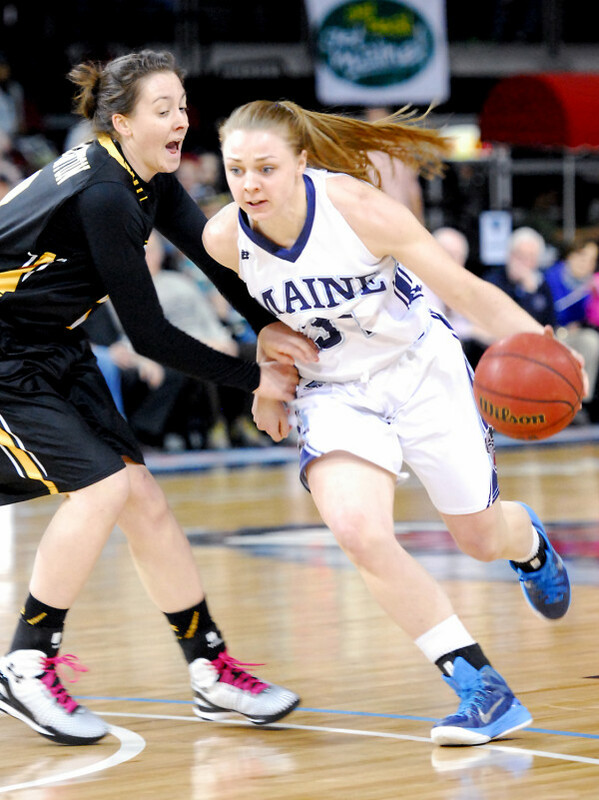 ORONO, Maine — Liz Wood is the face of the University of Maine women’s basketball program. For the next several weeks, she’ll likely be showing a bit of frustration, and some determination, on her own face. The Black Bears’ senior forward, who last season was an All-America East first-team selection and the conference Co-Defensive Player of the Year, has been sidelined by an injury. Few details were forthcoming on Tuesday, but UMaine athletics released a brief statement saying Wood is expected to miss three to six weeks with a knee injury. The 5-foot-10 Wood underwent arthroscopic surgery on her left knee on Monday. She was seen using crutches Tuesday inside Memorial Gym where her UMaine teammates were playing pickup ball. However, Wood was not made available for comment, and Black Bears head coach Richard Barron was traveling and could not be reached for his thoughts. Wood, from Catlett, Virginia, has been among the most heralded UMaine basketball players in recent years. Last season, she averaged 13.8 points, 7.7 rebounds, 3.4 assists and 2.7 steals, and she shot 48.7 percent from the field to help propel the Black Bears to a 23-9 record, a share of the America East regular-season title and a spot in the Women’s National Invitation Tournament. She tallied the program’s first-ever triple-double (11 points, 13 rebounds, 10 assists) in a Jan. 14 game against UMass Lowell on her way to becoming the 18th player in UMaine women’s history to eclipse 1,000 career points. Wood shot 49 percent from the floor (175-for-359) last season. Going into her senior year, Wood has racked up 1,133 points (12.3 per game), 643 rebounds (7 rpg), 265 assists (2.9 apg) and 196 steals (2.1 spg) in 92 career games. The timing of Wood’s knee injury could have been worse. Even though she will not be able to participate in the remainder of the team’s preseason conditioning workouts and likely will be limited as full-squad practices next week, a speedy recovery could have her back on the court for UMaine’s Nov. 13 regular-season opener at Harvard. UMaine has scheduled exhibition games for Nov. 6 against Vanguard (at Gorham) and Nov. 8 against Stonehill at the Cross Insurance Center in Bangor. Wood’s accomplishments have gone well beyond the basketball court. She earned the Dean Smith Award as UMaine’s top female scholar-athlete and was named the America East Female Scholar-Athlete of the Year, both in 2015. The biology major, with pre-medical studies in the UMaine honors program, also is a two-time Women’s Basketball Coaches Association Good Works Team nominee, is the president of UMaine’s Student-Athlete Activities Council and is a national SAAC representative. Wood was the America East Co-Rookie of the Year in 2013 and earned all-league second-team recognition as a sophomore in 2014.